The DestroyIt 4005 Strip-Cut Shredder from MBM is a great heavy duty, high volume, centralized office shredder designed to shred large amounts of material daily. The DestroyIt 4005 Strip-Cut Shredder features a "SPS" (Safety Protection System) package with a electronically controlled, transparent safety shield in the feed opening. It als includes an "Easy Switch" control element that uses color codes and back-lit symbols to indicate operational status. The Destroyit 4005 Strip-Cut Shredder will automatically stop when your shred bag is full or when the cabinet door is opened. It also has an automatic reverse and stop in case of paper jam. The Destroyit 4005 Strip-Cut has double protection against overheating, automatic start and stop controlled by a photo cell, high quality hardened steel cutting shafts that accept staples, paper clips and credit cards. All Destroyit shredders have a lifetime warranty on Strip Cut and Cross Cut shafts and wheels. All other parts have a 1 year warranty (excluding wearables). MBM Corporation presents the DestroyIt 4005 Centralized Office Model Business Shredder with automatic function and a 16-inch feed opening. Our innovative easy switch control element ensures simple and intuitive operation. The quiet, very powerful 2 1/8 hp single-phase motor with chain-drive system for continuous operation provides a shred capacity of up to 52 sheets in the strip-cut version and up to 32 sheets in the cross-cut. Any strip or cross-cut version, with the exception of the super micro-cut model, is suitable for the destruction of CDs and DVDs. The ECC Electronic Capacity Control indicator ensures continuous and efficient shredding. Our precision cutting shafts are constructed entirely of high-grade hardened steel and are backed by a lifetime warranty. Safety features include an electronically controlled transparent safety shield in the feed opening. It is part of the SPS safety package which sets the standard when it comes to operational safety. Consistently high performance is ensured by the automatic oil injection on the cutting shafts while the machine is shredding. With a 59-gallon shred volume, the pull-out back frame with roller mechanism allows neat and easy removal of the full bag. The super micro-cut version is equipped with a 40-gallon shred bin. The 4005 also comes with an environment friendly energy saving mode. DestroyIt - Quality Made in Germany. 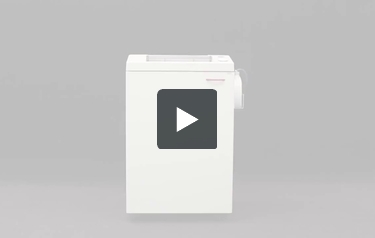 At the top of MBM's Destroyit line of centralized office shredders sits the 4005 shredder. The strip cut version is well suited for the high volume, low security needs of any medium to large offices. The robust motor is built for continuous heavy duty use. A lifetime warranty backs the high quality blades while the rest of the device is covered under a one year guarantee. Let's take a closer look at this convenient shredder. All MBM shredders are amply equipped with safety features and this one is no different. A protective safety shield blocks fingers and other objects from entering the blades. Start and stop is controlled by a photo cell sensor that detects paper in the feed and begins shredding when needed. One simple button operates stand-by, stop and reverse functions. Backlit symbols display operational status. Power is automatically cut from the motor if the shred bag is full, the cabinet door is open, or there is a paper jam. Jams are easily cleared as the auto reverse slides overfed paper back out to the user. To conserve energy, the machine powers down to a "sleep" mode after one hour of inactivity. A powerful single phase motor drives the hardened steel blades and is rated for continuous operation. Double protection from overheating helps prolong the life of your shredder. It also boasts of a sturdy chain drive system and durable gears housed in a dustproof chamber to stave off corrosion. An automatic oil injection system keep everything running smoothly. A wide 16 inch opening accepts a whopping 50-52 sheets at once and also takes in staples, paperclips, credit cards and CDs. A electronic display shows the exact sheet capacity level during use. Documents are sliced as fast as 40 feet per minute, one of the fastest rates offered by MBM Destroyit. The strips are collected in a sizable 59 gallon shred bag. The bag is mounted on a pull-out frame for easy removal and replacement. A high-quality wooden cabinet contains the shreds and acts as a noise reducer by absorbing sound from the motor, resulting in a quieter shredding experience.